Sometimes I feel like this small place of sharing what God is teaching me isn’t reaching anyone. It is just more noise in a noisy world of blogs and social media. This year as the New Year approached I finished seminary and a stirring in the dry places started. The dry ground was being plowed by the Heavenly Farmer who promises to grow His fruit in His children. So as I begin praying over this place and the New Year and what God would have me focus on. And the word that kept coming up made me cringe. I can tackle words like “stretch,” “grow,” “discipline,” and “holiness” because those are words that sound big. Words that seem deep and active. But the word that God kept stirring this year seemed somehow less…maybe even weak…And yet I know it is a word I need to focus on because it isn’t my natural bent. The word is “Joy” as in “the joy of the LORD is your strength.” (Neh. 8:10) And so over the next 366 days I will be focusing on the “joy of the Lord.” I will be focusing on finding all of my joy and delight in Him. Maybe this battle to find joy will no longer seem “less than” in my practical mind. I pray instead it will be the catalyst to draw me nearer to the LORD. Do you have a new word for this year? What is it? Welcome back to the writing fold, Miss Angela! 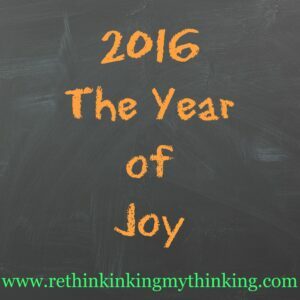 As an overly logical person, I also struggle to find joy. My word for this year is “sharpen”, as Proverbs 27:17 says, “As iron sharpens iron, so a friend sharpens the countenance of a friend.” I’ve always thought of this verse as me sharpening others, but I honestly don’t think I’ve allowed others to sharpen me. I’ve been too stubborn to change my ways. So this year is about listening to others, really listening to suggestions and criticisms. Because I can do better for the Lord. Glad to have you back, Angela. My word is Freedom, “Galatians 5:1 NASB: Walk by the Spirit: 5 It was for freedom that Christ set us free; therefore keep standing firm and do not be subject again to a yoke of slavery”. I determined to understand and live like Jesus demonstrated. He lived the Spirit of the Law by loving people, rebuking and disciplining when required, helping people in whatever way was requested and took vacations (mini ones at that). In other words, I desire to be the best dad, husband, son, friend or co-worker and trusting the Spirit to correct my actions/path, as I live. In one man’s words, “Just being a normal Christian person”.